The Formula One Monaco Grand Prix is this weekend. It is the most glamorous, prestigious race in motorsport's most glamorous, prestigious series. Here's everything you need to know. This infographic was put together by excellent Peter Leung on Richland F1. 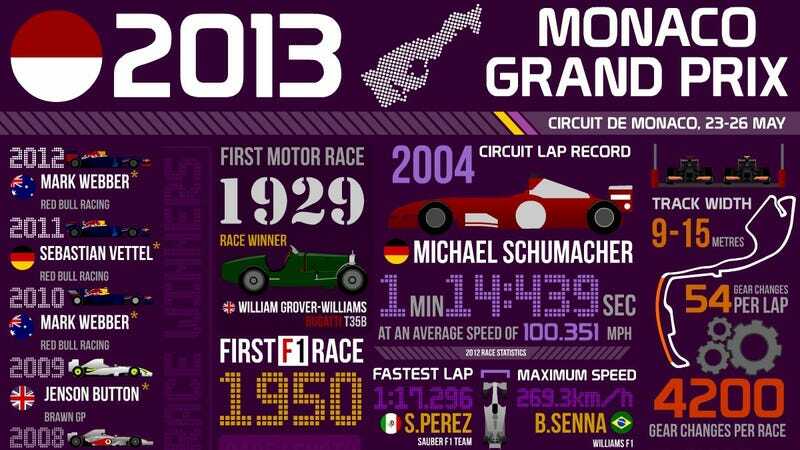 It covers the past seven winners of the race (and how many won from pole position), the track records, the number of gear changes per race (4,200! ), as well as every turn on the legendary track, largely unchanged since its Pre War inception. Now's the time to start booking tickets for 2014, folks.